The effective departure of Studio Ghibli earlier this year with When Marnie Was There (a departure that, if certain rumours about its head Hayao Miyazaki are to be believed, may be short-lived) has paved the way for new talents to emerge in the world of Japanese anime, with one talent in particular – Makoto Shinkai, a filmmaker since the late 90s before his first feature film, 2004’s The Place Promised in Our Early Days – being constantly heralded as the new successor to Miyazaki’s legacy. His latest film, and fifth overall, is the reason for this new praise, and for good reason: Your Name, based on Shinkai’s own manga of the same name, is a wonderful gem of a film with the imagination and fantastical qualities of a true dreamer. The story is about two very different Japanese high-school students, city boy Taki (Ryunosuke Kamiki in the original Japanese version; Michael Sinterniklaas in the English dub) and small-town girl Mitsuha (Mone Kamishiraishi/Stephanie Sheh), who suddenly wake up on random mornings to find that they have switched bodies with each other. Initially shocked (or, in Taki’s case, excited to fondle “his” breasts every morning), over time they begin to use the strange occurrence to help each other’s lives, such as securing Taki a date with a pretty woman at his job, and making Mitsuha more popular at her school. They begin to form something of a bond in the process, but it’s only when Taki tries to finally arrange a meet-up with his female body-occupier that things start to unravel, and their connection becomes ever more unusual and even impossible at times. 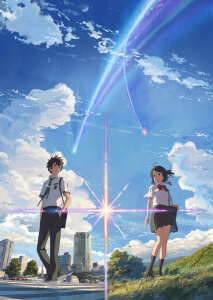 Without giving too much away, Your Name deals with a great many things ranging from teenage identity, romance, natural disasters, and sometimes other-worldly conveniences (a passing comet is a recurring motif, and an important MacGuffin for events later on), while also finding a way to balance effective human drama, light moments of comedy, and some suspenseful scenes on what surface there is left. However, Shinkai finds a way to make it all work, jumbling all these elements together to make something that should be quite messy and complicated, but is instead rather endearing because the characters are so likable and the story is one where you’re undeniably curious about where it’s all going to eventually end up. It’s definitely not predictable in the slightest, and even though the whole body-swap thing isn’t an entirely original concept, Shinkai has managed to crack a way to find something new to do with it, and the results are mind-bending and absolutely inspired. As should be expected from a major anime production by this point, Studio Ghibli or otherwise, the animation is absolutely stunning. It’s a slightly different style than Miyazaki – something you can certainly pick up from subtle frame movements and its editing, which can sometimes make it seem like an extended episode of a TV anime series – but the colourful backdrops of the countryside, the city of Tokyo, and several other locations visited in this film are all rich with texture and three-dimensional beauty, even looking like a real location even though we as an audience know for a fact that we’re looking at a series of drawings. It’s a world that you just want to immerse yourself into, and like the very best that anime has to offer it makes it seem like exactly the kind of place you would want to retreat to for a nice holiday, surrounded by people you actually like and having the most pleasant of experiences. Personally, I am not that into anime outside of Studio Ghibli; I have friends who are way more into it than I am, and that includes not just films but TV shows and manga comics as well. However, every now and then I enjoy watching something that even the most weary fan of this type of animation can genuinely enjoy, and happily Your Name is one of those films that I honestly wouldn’t mind revisiting in the future, even if to see how Makoto Shinkai managed to win everyone over in the first place. Your Name is a wonderful slice of anime that should cement Makoto Shinkai as a future talent to watch closely, as here he creates an intriguing story with likable characters and gorgeous animation, while balancing several themes almost effortlessly enough to win over even the most weary fan of anime.